What could be more fun than geocaching with Pathfinders? How about geocaching with Pathfinders in the dark? 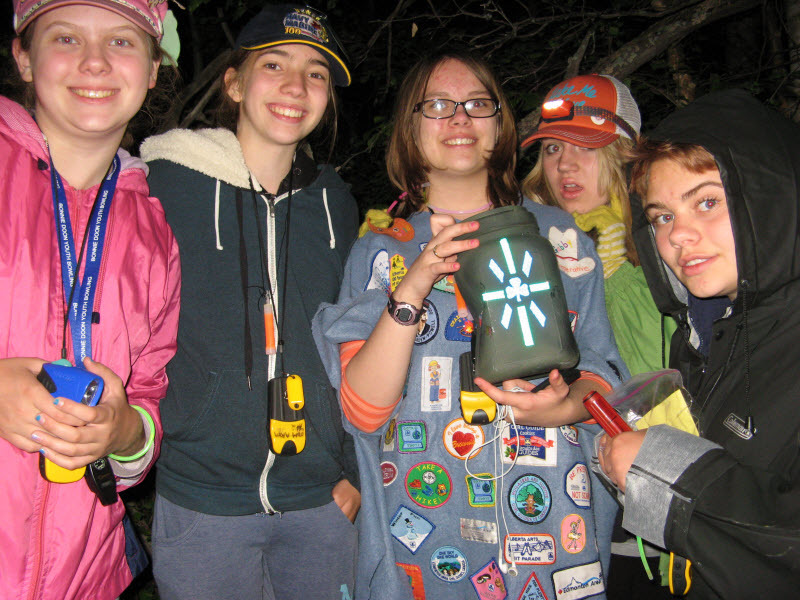 Night caching is an excellent way to introduce older girls to the next level of geocaching. More than just searching in the dark! Night caching is more than hunting for regular geocaches after the sun goes down (though it certainly ups the difficulty level for those up for more of a challenge). The leaders hid a container decorated with reflective tape off a trail at one of our area campsites. We did the hiding during the day, careful to ensure day hikers would not see the cache easily. After sunset we went back and waymarked the start of the trail with our GPS devices. We then marked trees along the trail using trail tacks so when a beam of light hit the tack it glowed back. We did this all the way to the cache. 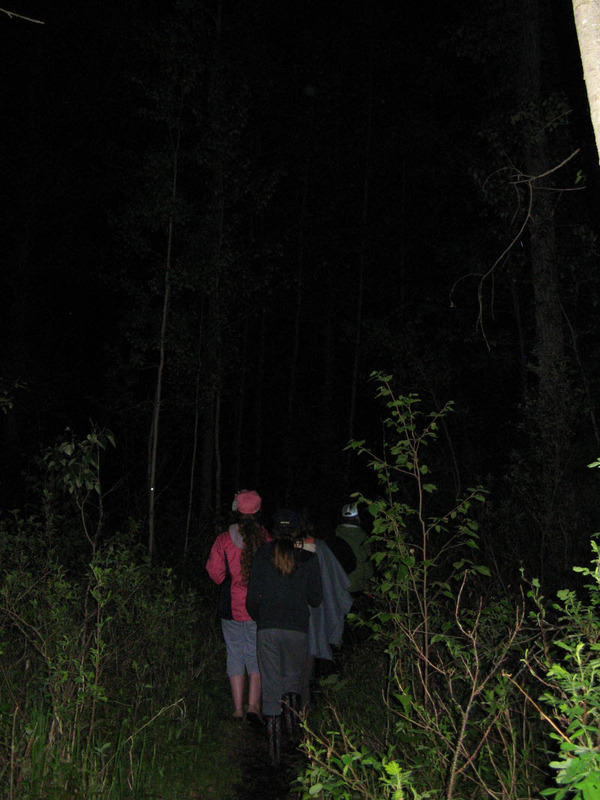 When it was time for the girls to find the cache, they used GPS to locate the start of the trail then needed to shine their flashlights into the woods to see the glow of the trail tack. They walked to the tree marked with the tack and repeated the process from tree to tree until they reached “Ground Zero” where trail tacks in the shape of an arrow pointed out the location of the cache. For a two point multi-cache, the girls were given the coordinates of the starting location where they would shine their flashlights into the woods to locate a glowing strip of reflective tape. They had to search near the tape for the cache container in which the coordinates for the second location was to be found. The girls then had to enter those coordinates into their GPS and find the next spot. Once again, the beam of light in the woods revealed the reflective tape near the cache. They then needed to use their geosenses to find the final cache container. The feedback from the girls was that they preferred the Trail Cache to the Multi (less work in that they only needed their GPS units to find the start of the trail). All in all it was lots of fun – so much so the girls have asked to do more. That spells success in my books! By guest blogger Elaun Cable Lind (a.k.a. GeoGuider75). Elaun is a leader with the 75th Edmonton Brownies and lends a hand when needed to help teach geocaching to other units in the Helen Burns District, Edmonton Area where she has been recently appointed Deputy Camp Advisor. This entry was posted in Camping & Outdoors and tagged geocache, meeting ideas, outdoor, pathfinders. Bookmark the permalink.